DISCLAIMER: This is simply MY experience with MY baby. I’m not espousing any particular method of sleep training or even sleep training itself to anyone. I just wanted to share my story. For anyone who knows me personally or has been following my blog, you’ll know we went through one helluva four-month sleep regression with our little one. I used to laugh at the term Mombie (Zombie Mom), but now I’ve lived it. I started to hate life. I started to have regrets about becoming a parent. It was a dark and unhappy place. Sleep deprivation has been used as a torture method, did you know? My baby boy used to nurse to sleep every night and regularly sleep an initial stretch of 5 or 6 hours for the first three months of his life. So we were taken by surprise by the sudden change. I had gotten into the habit of rocking him an extra 20 minutes or so before moving out of the chair to make sure he was in deep sleep (thanks a lot, Dr. Sears!). Sometimes even after checking his “limp limbs” he would suddenly wake up as I moved towards the bassinet, at which point my wife would take over holding and swaying him back to sleep. It started regularly taking us an hour (or two!) to get him to bed, and he was waking 5 or 6 times a night. Ugh. Then we experienced two incidents of “sleep training by accident”. Meaning, in my exhaustion at 4:30am I put the baby back in his crib after nursing him, STILL AWAKE, crawled into bed fully expecting to be getting up again in 5 minutes, and then us all waking up a few hours later. Meaning, HE FELL ASLEEP ON HIS OWN. TWICE. We knew he was ready for sleep training. My wife and I were not ready to end our room-sharing arrangement, but we went ahead with a new bedtime routine that involved putting baby to bed awake. None of this, half-drowsy BS, just awake. At this point, nursing to sleep had stopped being our bullet-proof method anyway. After much reading and researching, we chose the Sleep Lady Shuffle method. Also called Parental Presence, basically you stay crib-side for the first three nights, watching your baby learn to fall asleep on their own. The next three nights you sit in the middle of the room, and the next three nights you sit in the doorway. Then, presumably, you are done and can put them down, sing a lullaby, leave, and your (magical unicorn) baby will then fall asleep. We waited until my partner had a few days off over a long weekend to start. We had both really psyched ourselves up for it, expecting horrendous screaming and it being a big nightmare. Nothing could have prepared us for what happened. Which was, he just fell asleep. No tears. Nada. Huh? I thought this was “cry-it-out”? Yup, our lil’ guy just lay there, fully awake, cooing a bit, scratching the sheet, moving his head side to side, scratching the sheet some more, until one minute he was asleep. It took 40 minutes that first night, and he slept a longer stretch than he had in two months! Needless to say, my partner and I were shocked. And thrilled! The second night it took 30, the third night it took 25. He went from waking up every 1-2 hours to sleeping 4-5 hour stretches before his first night feeding. And no tears at bedtime. Naps, on the other hand, were an entirely different story. He wailed. But, since we’d read up on this, we knew that naps take longer to adapt to. At this low point we were often facing 10 min crap naps or motion naps. Quickly, the morning nap became easy, and we often just went with motion naps for the rest of the day, or at least the third one. 30 minute naps became 45, and after a month or so, most naps were no longer a battle. Nowadays he pretty consistently sleeps two 90 minute naps a day- and at pretty consistent times too! I should also mention here that we decided to be soft on the whole soother thing. After 10 minutes of crying we would give in and he would fall asleep right away. Now we just give it to him when we put him down. So yeah, our baby sleeps with a soother. He also has a little wooly blanket and a lovey for comfort. 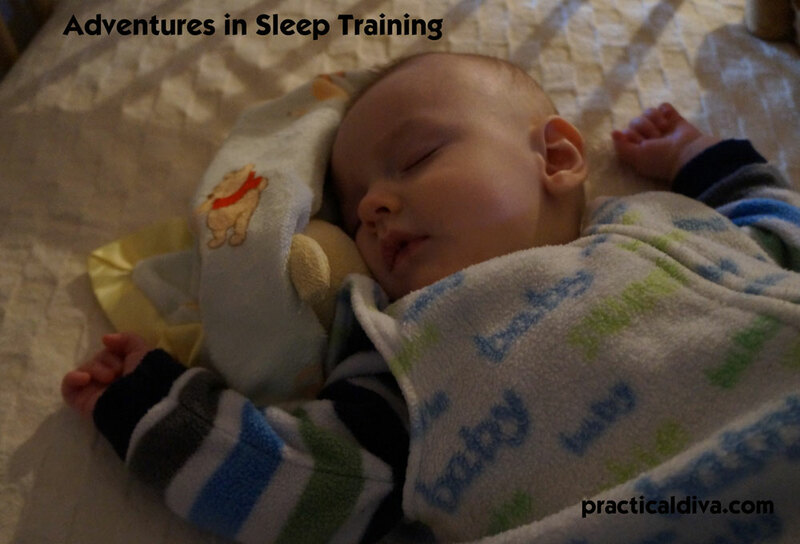 Was sleep training our little one and having him learn to fall asleep independently our golden ticket to sleeping through the night? Heck no. He’s 9 months old now and still rarely sleeps longer than a 7 hour stretch. Only recently has he semi-regularly started to need just one night feeding, it’s often still two. Two months ago we went through a few weeks of him waking three times a night. But for us, sleep training was never about night weaning. We just wanted bedtime to not be an hour-long battle anymore, and for him to nap in his crib. In May we traveled for almost three weeks and our baby slept anywhere and any time, without crying or needing rocking/swaying/nursing to get there, so he’s pretty awesome in my books. That experience proved to us that he was ready for his own space, so we moved the crib out of our bedroom. Sigh. They really do grow up so fast. I’m happy we kept him close for as long as we did: co-sleeping within arms reach in the bassinet from day one, occasional bed-sharing (mostly to survive the sleep regression), then room-sharing with him in a crib, and now separate rooms. It appears that he’s sleeping better now, and so are we. It’s nice to have our bedroom back! We are still a ways off from complete night weaning I think, and I’m fine with that. Truth be told, I’ll miss those quiet, gentle night nursings. So that’s our personal story with sleep training. We waited until he showed us he was ready, and it worked great. It’s such an important skill to teach babies, and vital for parent’s sanity I think! So… does YOUR baby sleep through the night? !